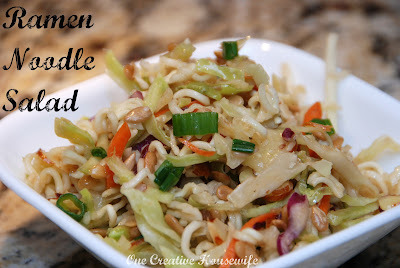 If you are looking for a twist on a salad to take to a picnic or serve for a meal at home, a Ramen noodle salad could be just what you are looking for. It it crispy, salty, nutty, delicious and different. This salad makes a great addition to anything you are making on the grill, and is absolutely delicious with the chicken pull that I shared with you earlier. 1. Rinse coleslaw and broccoli slaw in a colander. 2. In a large bowl mix coleslaw, broccoli slaw, sliced almonds, sunflower seeds, and scallions. 3. In a small bowl whisk vegetable oil, granulated sugar, white vinegar, and flavor packets together. 4. Add dressing to coleslaw mix and toss. 5. An hour before serving break the Ramen noodles into small pieces and mix into salad. *You can make the dressing a day or two ahead of time and keep in the refrigerator. Whisk before adding to coleslaw mixture. That recipe sounds so yummy! Visiting from Tip Junkie. This is one of my favorite summer salads! Your recipe is almost identical to mine.